Bangalore: It was curtains for the 18-year old controversy on unveiling of statues of poet-saints Sarvajna (Karnataka) and Thiruvalluvar (Tamil Nadu). 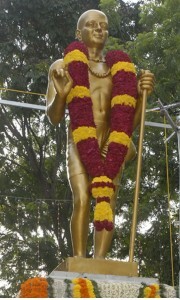 On August 9, Thiruvalluvar’s statue was unveiled in Bangalore by Karnataka – Tamil Nadu CMs B S Yeddyurappa and M Karunanidhi. 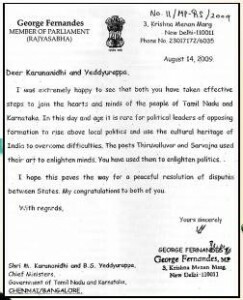 The gesture was reciprocated with Sarvajna’s statue being unveiled in Chennai on August 13.With this act, for all those who had criticized and derided Yedyurappa for his impatiance, the Chief Minister has turned out to be a ‘path breaker’. It was perhaps this very impatiance that was a vital quality to break the ice which had vexed the two states for over 18 years. 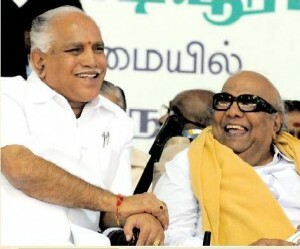 Given the animosity between Karnataka and Tamil Nadu this action may perhaps kick start the thawing process.In the past, the manner in which the two state governments have dealt issues like Cauvery water sharing, Hogenkal, the Tamil-Kannada language row etc., there seemed little hope till now of an amicable dialogue platform. All that one witnessed was violent dharnas, fasts, flying tempers, provocative public statements, inter-state tribunals with endless litigation processes. In fact, for the common man battling life out everyday, these only seemed magnify the problems.With the statues being unvieled, one can now look forward to some amount of warmth and stronger bonding. 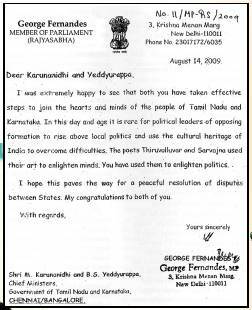 In their times centuries ago both, Sarvajna and Thiruvalluvar had preached universal brotherhood and upliftment of weaker sections. Today, at a time when external forces threaten to tear the national fabric, this act atleast brings us closer to the much required formula – unity. “the fostering of friendly ties between the two states is a model for the entire country” Yeddyurappa said in his speech at the unveiling ceremony in Chennai.